19.03.2011 v2.1 adds the ability to call a function after the section has expanded. You can specify a shared function that will be called on every section, and/or a function that is called on one specific section. The CEWP code must be updated from v2.0 to include the new parameters. 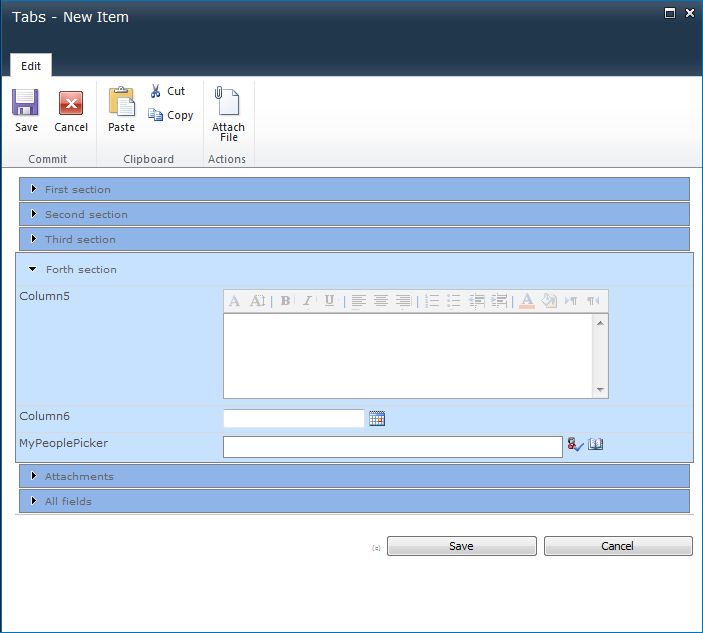 This solution is used to break up a SharePoint form into sections – like in an accordion. You can have a section catching all orphans (fields that are not displayed in any other section). 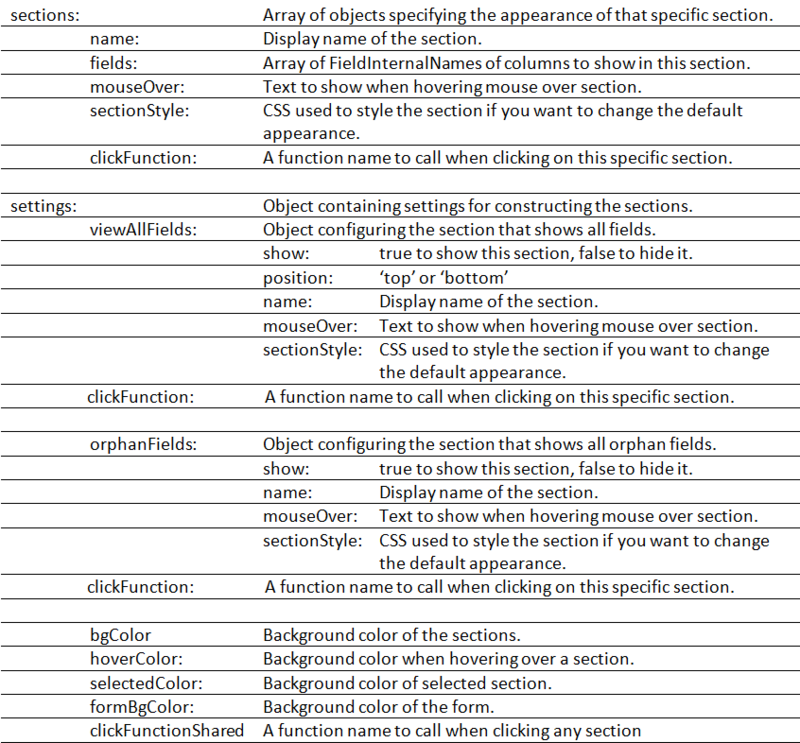 Useful if one adds columns to a list without updating the script call. You must change the “src” to “AccordionForSharePointForms.js” to match your local file. If you like to use a local instance of jQuery, change that as well. accConstructor: The object constructed in “var accConstructor”. selectedAcc: Integer that specifies which section to preselect. I have added the attachment row as a “field” you can insert in a selected section. It is named “attachments”. Look at the example CEWP code and the image. The solution is licensed under the MIT X11 license. You find the license agreement by clicking the little (c) to the left of the lower button row. You continue to lead the innovation pack by crafting solutions that are truly aimed at benefiting end-user. Thanks! is it possible for this or your Tab script to have a link to an accordian or tab. Example: in your image above is there a way to link to Section 3 and have it expanded? The parameter for the tabs is “sTab”. Again, I am not worthy! you are the master. Does version 2 have the ability to nest accordian with in v2 Tabs. I dont want every tabs to have accordian, but I would like to add some fields to the accordian, under one, two or three tabs. I know you did this for version 1, but looks like a differet script or cobmination of both tabs and accordian. You cannot combine these two. You would have to use another custom function to expand or collapse fields within a section. Look at the new release (v2.1) where i have added the ability to call a function upon selection of a section. I will post a similar update to the tabs solution later tonight. I abandon the Tabs script and treid to implement this one in its place. At first it appeared to work perfectly. Uppon further testing it got a little buggy. I have 10 sections and showing attachments with attachments last in the order (total 11 sections). any section i click no problem except for the last 2, one being attachments. I comment them out and it works perfectly. I thought maybe it was something I mised in the line of code. so i checked the and commented out 2 othjer sections and added them back. worked perfectly. As soon as I added the 10th section it go t buggy. My last section, when clicked, jumps to second place and stays there until page refresh. Is there something set to limit the sections in the script? Please test it and let me know if it fixes your issue. What needs to be changed in this script to make the sections collapseable when an open one is clicked? I find myself clicking an open section and nothing happens. I ahve also witnessed this same action from other users. As the script is made right now, one section has to remain open at all times. If you would like to modify the code to address this issue, i recommend to “flag” each section with open or closed – a flag that has to toggle on click – and if it is closed, suppress the showing of the fields effectively collapsing the section. I’m to busy to implement this into the current solution, but it should not pose any big problems – see what you can make out of it. Also I am finding with large sections the navigation is a little funky. Is there a way that when the section is clicked, the section works like a bookmark and defaults to the top of the page view? what happens now is no scrolling, and sometimes with the larger section label is higher than the page view and user must scroll up to get to the first field in the section. sorry did not refresh before i posted. I understand your time limitation. I know I am a pain. I have a quick scenairo question. I am using the dynamic hide/show fields based on user selection, in conjuction with teh accordian script. Initially I could not get both to play well, but then I figure out I needed to add the dynamic function to the click function of the Accordian. works fairly well. so now here my issue. I have a form with several sections. as the form moves to the next section, a workflow message goes out with a like to edit the item, in the section edits need to be made. in order to get the dynamic function to work I had to add it to script so it fires on page load, and add it to the click function, so if user navigates to another section it works. whats happening is if I start on a different section it is firing off the function and showing the fields before user gets to the section. so here is my question. in your content type script you look for a field to not be undefined, then fire the script. can this logic be applied in the accordian script? Before I fire the dynamic function I look to see if field is not undefined. will this work with the way to hide the fields in the accordian script? No, not in the same way, but you could do a check whether the field is visible or not. Pow! that’s exactly what I was looking for. Thank you! I have a little different task. I need to make groups of fields in Forms (NewForm, EditForm). It must be like “Accordion”, but with possibility to open two or more groups in the same time. Could you explain to me, how can it be done? Or give me a link to descriptions of this question? you’re an absolute legend !! Sorry, but i cannot reproduce this in my environment. Please post back any findings. I seem to have a problem ordering some of the fields in an accordion section – they are not showing up in SharePoint in the same order that I have them listed after “fields:[“. Any ideas? Thanks – this is working perfectly for almost all of us. 🙂 I have one IE 8 user saying that when they click on the individual SP list items in list view, the items do not display (blank white screen) unless she goes to Tools > Developer and forces the page to display in IE 8 Standards instead of Quirks mode. I am running IE 6 and can’t recreate her issue. Just curious if this is known or user error! I have not had this error myself and therefore cannot pinpoint the cause. I have a quick question: I am trying to hide one field when the other field is empty. I do not have custom form so I cannot assign IDs to have a finer control on DOM elements. Could you possibly give me a hind on how to do that on out of box form? BTW, I am using out of box form because I have more than 100 fields and the form crashes as it takes longer than 1 sec for XSLT transformation. Question. How would I modify the code to account for multiple content types? Any assistance would be greatly appreciated. I’ve been trying to use your code, but the fields insist on showing always at the top of the page, instead of under the section I click on. The fields displayed are the correct ones according to constructor defitition, they always show before the section headers. Have you seen this behavior? Hi Alexander. Again, fantastic code. Having a bit of a challenge though. When i do “…NewForm.aspx?toolpaneview=2” it doesn’t allow me to add a CEWP below the form. The “ADD WEB PART” option is always above the form. So I guess my question is: would there be a way around this? Thanks! You’re crafty work here is really helping my learning. Two thumbs up! I tried your accordion trick but I have a bit of a challenge. When I open any of the form the first time, all the columns are under the 1st accordion pleat but not after I expand other pleats i.e. after I expand any other pleat then go back to the 1st pleat, all the columns that should be under the 1st pleat are reflected and not all the columns. Any ideas what I am doing wrong? Thanks! Is this work for SharePoint 2013? But the next version of Dynamic Forms for SharePoint will have accordion built in. Follow me on Twitter or follow my blog to get an alert when it is released. The DFFS solution has accordion functionality built in. 1.how to get the accordion effect, like when expanding and collapsing transition effect ? 2. how to keep one group always expanded and others have the effects of close and open ? Unfortunately I’m not maintaining this solution anymore. Look at DFFS instead – this has accordion functionality built in.